Calendars.com is your ultimate resource for all types of calendars. Whether you’d like to see a different cat every month or 12 different American landscapes, Calendars.com carries what you need. 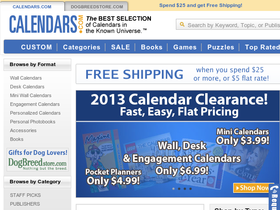 Find wall calendars, desk calendars, engagement calendars, and more at Calendars.com. Browse the categories of art, celebrities, entertainment, food and drink, games and puzzles, humor, pets, inspirational, sports, and travel, amongst many others. Before you choose this year’s calendar, check RetailSteal.com for Calendars.com coupons, Calendars.com discount codes, and Calendars.com promotions. Calendars.com offers free shipping on orders over $25 and $5 flat rate shipping. Refunds are allowed within 30 days of purchase. See website for details, exclusions may apply. Check out the sale section at Calendars.com and save 50% off a wide range of calendars. Shop at Calendars.com and enjoy free shipping on all orders. Click here for code. Save 15% on your calendar purchases with this coupon code. Click link for savings. Shop at Calendars.com and enjoy free shipping on orders $25+. Click here to shop. Shop at Calendars.com and enjoy 15% savings on Halloween products. Click here for code. Visit Calendars.com and receive free gift wrap with any purchase of $20 or more. Shop at calendars.com and enjoy shipping for only $1. Click here for code.